I've got to admit it: this is one of my favourite art projects. It borrows from Science (making observations, and learning about "living things" more generally). 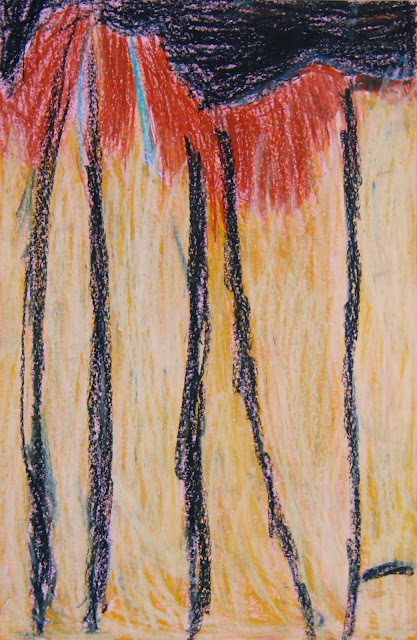 It uses simple materials (oil pastels and construction paper). 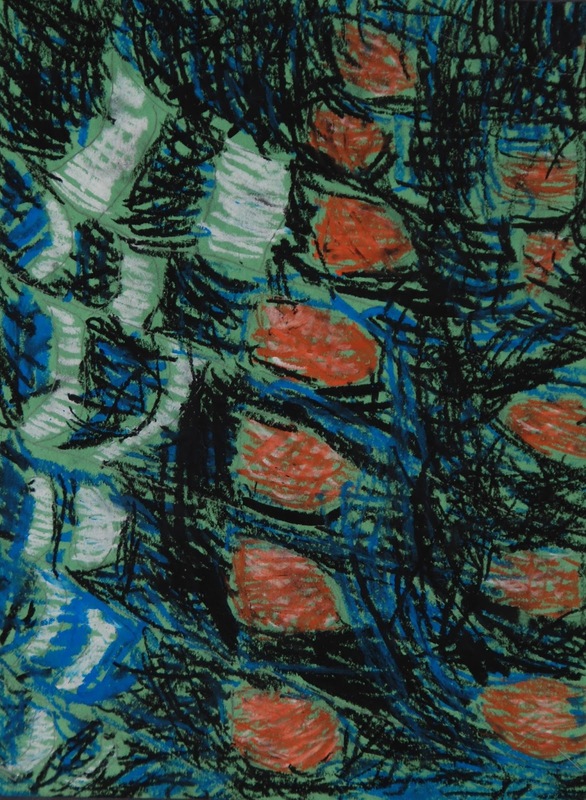 And it introduces the art concept of mark-making. We begin by looking at lots of macro (close-up) photos of butterfly wings. We look at all of the little scales that coat the wings and create the colours and patterns. These scales make up the "fairy dust" that comes off of the wings when you touch them; or sometimes when the insect's wings move violently. Typically I will show the kids a dozen or so photos in a slide show. 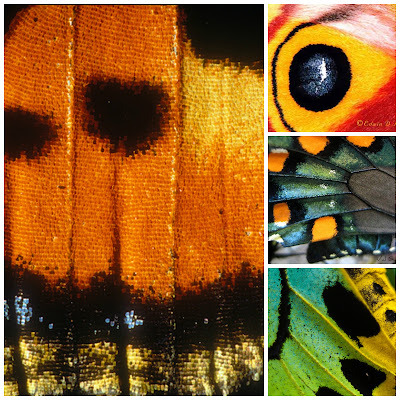 A small selection of close-up photos of butterfly wings. After that, I let each of the kids choose a close-up photo (printed) of a butterfly wing. All of them are different, so no two kids will be drawing the same picture. I let them choose a coloured piece of 12x18" construction paper, and show them how to draw the big shapes of their wings with white chalk. 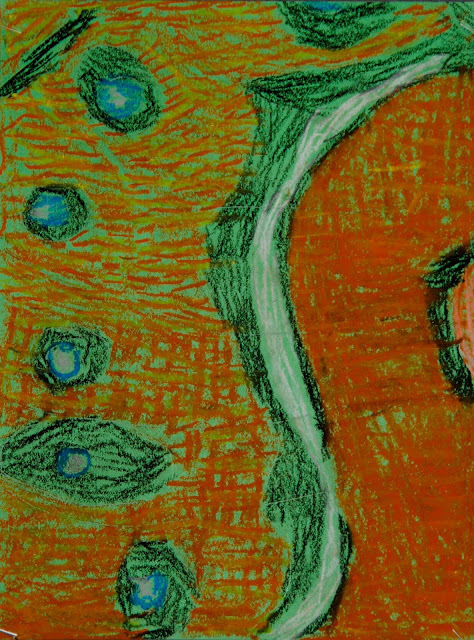 Then I show them how to "colour" in their shapes using short lines for marks, in imitation of the scales themselves. It's not quite pointillism, but it's far from just "colouring in" the shapes as well. It creates texture, and rhythm and movement. 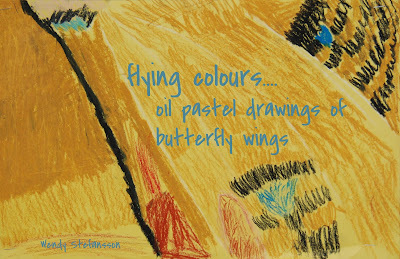 Here's a selection of butterfly wing pastel drawings from several classes of Grade Ones.